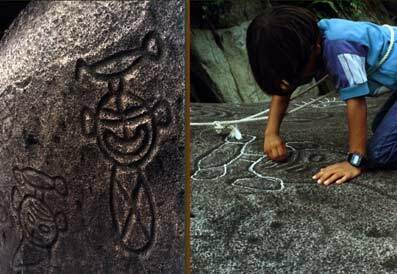 The Taino Indians carved these petroglyphs. They lived on 'Boricua' fairly peacefully until Ponce de Leon, a Spanish Conquistador, arrived to settle the island in 1508. Taino Petroglyphs on river rocks on the Rio Blanco River. Daniel is tracing the indentations with chalk ( not advisable unless you use a special soft chalk). He's got a rope around him for safety. It is still not known how the indians were able to create such deep grooves in granite rock. There are many sites with petroglyphgs carved on rock around PR. Robin is the best guide to take you there. Off road # 191 above Naguabo on the south side of the rainforest. One theory about the meaning of these guys with 'birds' on their heads is that they are depicting psychedelic drug induced voyages and the little guys represent shamans.